Each Saturday in the Fall when the Rebels football team is at home, the center of the Ole Miss campus comes alive at a location known as “The Grove.” This 10 acre park, filled with old oak trees, is home to one of the best tailing scenes in all of college football. On game days you’ll find some on the most elaborate tailgating setups anywhere. No vehicles are allowed here, only tents that can be setup the night before. 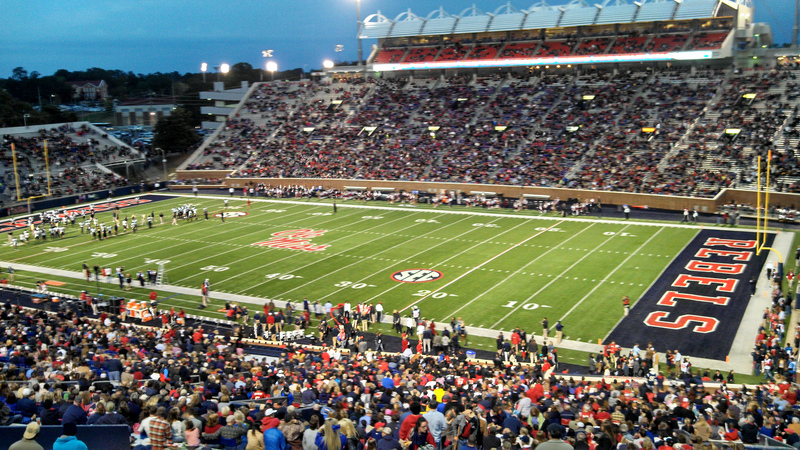 The atmosphere is like a giant cocktail party, but filled with Ole Miss Rebel fans. Two hours before kickoff the atmosphere becomes even crazier as the “Walk through the Grove” occurs as the football team walks to Vaught Hemingway Stadium. Built for the Ole Miss Rebels, Vaught Hemingway Stadium is the largest stadium in Mississippi and one of the oldest stadiums in college football. In 1915 a 24,000 seat stadium was build a part of a federally sponsored project at the University of Mississippi. It was originally known as Hemingway Stadium after Judge William Hemingway, chairman of the University’s Committee on Athletes. Over three decades passed before any substantial expansion projects were completed at the stadium. One of the largest pressbox’s was constructed before the 1950 season. Like many other teams during the early 1970s, the grass field was removed and replaced with Astroturf. The first major expansion of the stadium occurred during this time. Before the 1971 and 1973 seasons, seating was added at both the east and west sides of the stadium. Seating was added in both endzones prior to the 1980 season, increasing the capacity of Vaught Hemingway Stadium to 41,000. The facility received its current name, Vaught-Hemingway Stadium in 1982 as the stadium was named in honor of legendary coach John Howard Vaught. The original pressbox was removed and a new one was built along with a club level in 1988. Two years later, lights were added to the stadium and seven years later a new video/scoreboard was installed. Before the 1998 season, construction was completed on the upper deck on the east side of the stadium boosting the capacity to 50,000. Prior to the 2002 season, the south endzone was enclosed, giving the stadium its current capacity of 60,850. The most recent change at Vaught Hemingway Stadium occurred before the 2008 season when a new $6 million, 48 ft. by 84 ft. HD video/scoreboard was installed replacing the existing Jumbotron. In August 2014 Ole Miss announced plans to expand Vaught Hemingway Stadium. After the 2014 season the south endzone was renovated and expanded. This project increased the number of field level seats and include 30 new luxury suites. Before the start of the 2016 season, the latest renovation project at Vaught Hemingway Stadium was completed. This $59.5 million project not only expanded the seating capacity of the stadium to over 64,000 but added other features to enhance the game day experience including a new video board in the north endzone, two video boards in the south end zone and a new sound system. The seating capacity increased by over 6,000 with the addition of 30 luxury suites, 770 club seats and additiona seating around the stadium, making it the largest stadium in Mississippi.